From the beginning, family shaped Roosevelt’s character. He idolized his father, Theodore, adored his mother, Martha (known as Mittie), and kept close to his brother and two sisters throughout their lifetimes. Quentin Roosevelt, born in 1897, said to be the child most like Roosevelt, dropped out of Harvard to volunteer as a pilot during World War I, and died heroically in battle at age 20. 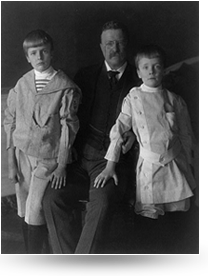 When the children were young, and Roosevelt was separated from them by school, war or expedition, he sent illustrated letters of reflection and love; the children were never out of his mind and heart. This correspondence later was compiled into a book, Theodore Roosevelt’s Letters to his Children, an international best seller, published in 1919. Roosevelt’s role as devoted family man may have been his most enduring legacy.